William Wordsworth takes a walk with his sister, Dorothy, and is inspired to write "I Wandered Lonely As A Cloud". The American School For The Deaf, the first American school for deaf students, is founded in Hartford, Connecticut. President Lincoln calls for 75,000 volunteers to stop the insurrection that became the Civil War. President Lincoln dies a day after being shot in the head by John Wilkes Booth. Andrew Johnson becomes President. The Titanic sinks the day after striking an iceberg in the North Atlantic. Bergen-Belsen concentration camp is liberated. The B-52 Stratofortress makes its maiden flight. The first Ford Mustang rolls off the showroom floor. Two bombs explode near the finish line of the Boston Marathon. Is music ok for this thread? Plus, in a way of introduction (and proof that I am not a BOT/Spammer), my name is Randall, from Fort Worth TX. Chaucer tells The Canterbury Tales for the first time. Daffy Duck makes his first appearance, in "Porky's Duck Hunt". The best friend I've ever had was born. Apollo 13 returns, safely, to Earth. An explosion at a fertilizer warehouse in West, Texas kills 15, wounds 160. Lt. James Cook sights the east of coast of what would become known as Australia. Gen. Douglas MacArthur retires from the military. Charles Manson is sentencd to death fro the Tate-LaBianca murders. ATF and FBI agents lay siege to The Covenant, The Sword, and the Arm of the Lord compound in Arkansas. The CSA surrenders two days later. The Simpsons premieres as a short on The Tracey Ullman Show. A gun turret explodes on the USS Iowa, killing 47. The 51 day FBI siege of the Branch Davidian compound in Waco, Texas ends when fire breaks out in one of the buildings. 81 are killed. South Dakota governor George Mickelson is killed, along with seven others, when a state-owned plane crashes near Dubuque, Iowa. The Alfred P. Murrah Federal Building in Oklahoma City, Oklahoma is bombed, killing 168 people. Fire breaks out in Grand Forks, North Dakota, which is inundated by the Red River Flood. Eleven buildings are destroyed. Fidel Castro resigns as First Secretary of the Communist Party of Cuba, a title he'd held since July 1961. Boston Marathon bombing suspect Tamerlan Tsarnaev is killed in a shootout with police. I'm amazed Tasman discovered New Zealand and didn't have a clue Australia was there. Then it took another 130 years before Cook found Australia. Google Earth would have shook those boys up. Robert E. Lee resigns his commission in the U.S. Army to command the forces of the state of Virginia. The Red Baron, Manfred von Richthofen, shoots down his final victim. Adolf Hitler makes his final trip to the surface from the Führerbunker. It is his 56th birthday. The League of Nations is offically dissolved. Columbine high school shooting kills 13, and injures 21. The semi-submersible drilling rig Deepwater Horizon explodes and burns. Oil spills for six months. For the first time, optical fiber is used to carry live telephone traffic. The last F-117 Nighthawk in service is retired. Coca Cola has the biggest brainfart ever, and reformulates its product and releases it as "New" Coke. Yeah, that lasted three months. The first YouTube video is uploaded, entitled "Me, At The Zoo". 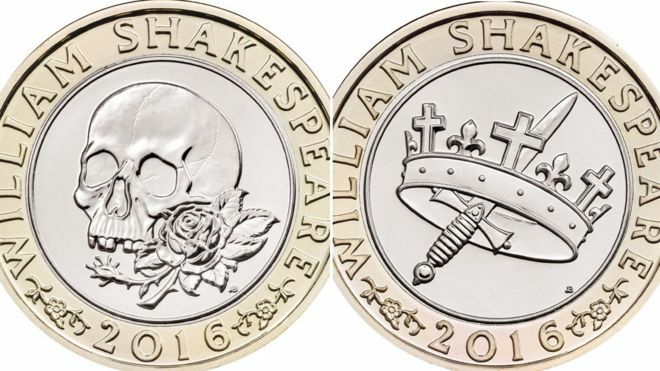 can one of you Brits get your hands on one of these 2# coins for me? Those are 2 of 3 different coins. Which do you want? Click on the image to order all 3 from the Royal Mint. Oh. I thought the crown was the back. I want the skull. Thanks! Cool, the Queen and her mother. He could get this nice shiny limited edition version and have it welded onto his Harley's gas tank, maybe one on each side. Nah, silver matches, gold clashes. And it is the Pound Sterling, not the Pound Carat. I suppose silver is more authentic too.